Fat loss is not easy. Getting under 10% body fat is a whole new level of difficult. Not many people are able to achieve this due to improper training methods or lack of consistency. Your body has stubborn areas (such as back fat and the lower abdominal region) which makes it tough to get into single digit body fat levels. Hours of cardio won’t solve this and will most likely lead to a fat loss plateau well before you reach under 10% body fat. Not to mention the several pounds of muscle you’ll lose in the process as well. The secret to getting under 10% body fat while maintaining your hard-earned muscle is with HIIT. 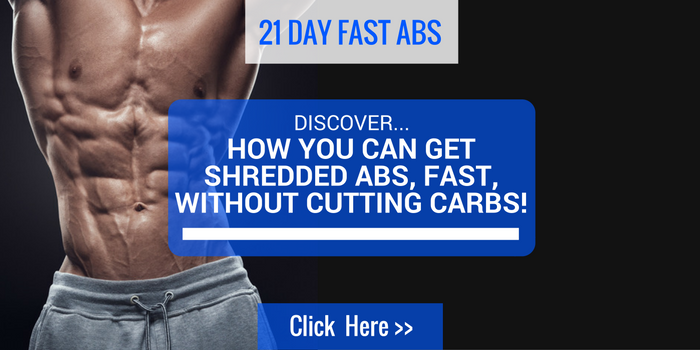 This will help you get rid of back fat as well as expose muscles normally covered by stubborn fat such as your Adonis Belt (“v lines”). However, the key is to slowly and consistently progress HIIT into your routine and use it along with a weightlifting routine. In this article I’m going to show you exactly how to get under 10% body fat by incorporating HIIT into your workout regimen. First of all, for those of you who don’t know, HIIT is a training method in which you alternate between maximal intensity work periods and rest periods. It is often performed with sprints but can be done with basically any exercise as long as you perform the work periods at maximal intensity. There are several reasons why HIIT is superior to other training methods for fat loss. But long story short, HIIT helps is so effective in getting rid of stubborn fat because it increases the level of fat oxidation within these areas, creates a spike in hormones that aid in fat loss, and prevents muscle loss. Its effectiveness can be seen plain and simple by looking at the bodies of sprinters. They’re lean and muscular and the majority of their training is in a HIIT manner. Similar to a weightlifting routine, the key to continuously losing fat without plateauing is by progressively overloading your cardio regimen. However, with HIIT we must do this very slowly as it places a lot of stress on the body. 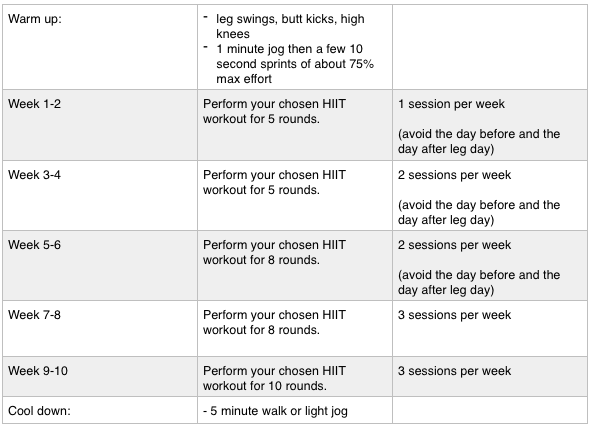 For those who are not currently doing HIIT, I suggest you start by performing 1 HIIT session per week of the following workout. For this workout you will pick 1 exercise that you will be using to perform HIIT. You can choose from sprints, the elliptical, rowing machine, cycling, etc. The point is to pick an exercise that you enjoy (or don’t “hate”) and can perform at maximal intensity without pain. Before your workout make sure that you do an adequate warm up, as well as a cool down after your workout. Now that you know the general outline of the workout, let’s see how we can slowly progress this to avoid reaching fat plateaus. Use the chart below for guidance. As you can see, we are going to progressively overload your HIIT workouts over the course of 10 weeks. We do this by either increasing the number of rounds you’ll perform in each HIIT workout or by increasing the number of HIIT workouts you’ll perform a week. I suggest that you don’t exceed performing HIIT 3x per week, as it’s very stressful on the body especially when used with a regular weightlifting routine. The best time to perform these sessions would be in the morning before you’ve eaten. This is because HIIT becomes even more effective when done in a fasted state due to an increase in abdominal blood flow and fat oxidation. Also, keep in mind that doing this routine alone is not enough to get you below 10% body fat. You need to also perform a weightlifting routine consistently as well as ensure that you are eating at a caloric deficit. If you’re eating more calories than you’re burning a day then you’re not going to lose any fat regardless of how much HIIT you perform. Like I said earlier, getting to a body fat level below 10% is difficult and takes a lot of dedication. But with that being said, if you follow the plan above along with a moderate caloric deficit and weightlifting routine then you will eventually get there. 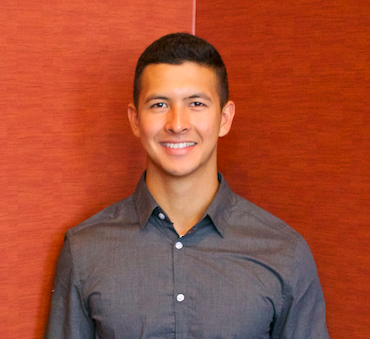 Jeremy is a personal trainer and Kinesiologist based in Vancouver, Canada. He specializes in fat loss and HIIT, which led him to create HIITyourbody.com. From quick HIIT workouts to full out HIIT plans, you can find it on his site.